It is early, 4:24 am. I have been awake for 2 hours and up for the past hour. The main causes of my sleeplessness is heartburn and lower back pain. I ate pizza for dinner last night. I suspect the pizza is what gave me heartburn. The heartburn is dissipating, whereas the back pain remains. My back hurts less in a sitting position than in a lying position. Bob and I visited with Stacey, Harper and June for a few hours yesterday afternoon. I brought over a portable floor gym, the Fisher Price Apptivity Gym, that I purchased this week. I wanted something new and fun to entertain the girls while at our house. See the peek-a-boo mirror? The mirror is removable. An iPhone or iPod touch device can be inserted in the place of the mirror. 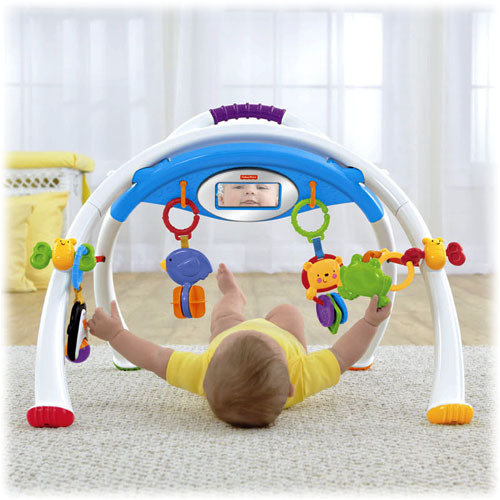 Fisher-Price has free apps that can be downloaded to be used with this Apptivity Gym. Babies can interact directly with the iPhone or iPod by batting at the overhead toys. Besides providing entertainment for the baby, batting at the overhead toys enhances gross motor skills. The other toys — a roller ball penguin, froggy with beads, birdie paddle wheel and lion clackers — strengthen fine motor skills while providing baby with busy activities. June spent most of the time with the activity gym. She liked it a lot. Harper entertained us by showing Nana Linda and Grandpa how close she was to crawling. Oh, our granddaughters are growing up so quickly! We were at the house when Mike came home from work, so we got to visit with him for a while too. We had a great visit. My favorite part of the visit was “family circle”. All of us sat on the floor and listened to Bob play the guitar. I hope we have many more “family circles”. Sounds like you and I have a lot in common besides grand children! Hope your back is doing better soon! Linda, I am sure you all had a great time with your grandbabies. Cute photos. Looks like you all had a nice visit. 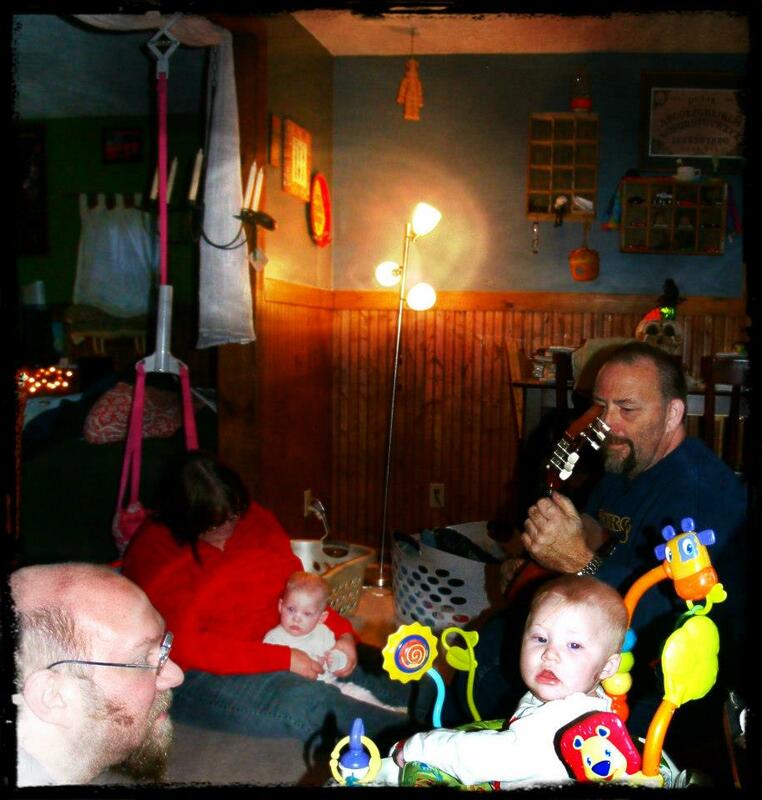 I’ll bet those baby girls enjoy Bob’s music…. Hope you feel better today—and get to take a LONG nap!! Oh hello Linda, i didn’t know you are the one who commented in my post, also didn’t know you have a new blog. I am glad you visited so i am led here. I am sorry about your back, we share the same condition. About that heartburn, i had an experience before of extreme heart anomaly after eating pizza. I throw up and down, and i managed my diet for a month to return to normal. I had no coffee, no oil, no spices, less carbohydrates, etc. Take care. Don’t you just love being a grandma! And it only gets better as you go along.